So often we think of the River Nidd in association with the harnessing of its waters to provide power for mills and industries, but it has for a long time also offered leisure, sport and nourishment to those who can benefit from its natural resources. There are many who covet the excellent fly fishing it affords, and there are those who do have the right to fish and land the perfect catch. 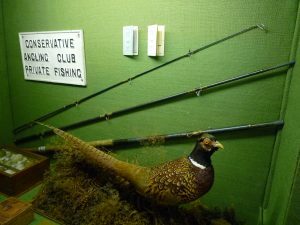 A fine river rod, displayed in three pieces, is a later version of those early models that one can read about in Izaac Walton’s famous ‘The Compleat Angler’ (1653), and the development of which probably led to fishing becoming the sport enjoyed by so many today. Made of fibreglass, it is about 50 years old, and was used by John Breckon up and down the river for coarse fishing and trout for 20 or 30 years.